One way to earn some extra money is to take some online surveys using a site like Swagbucks. Swagbucks* pay you cold hard cash for each survey you take and you can even earn money for playing games, watching videos or searching the web. You can then get paid out on the money you’ve earned in the form of Gift Cards or PayPal cash. Another simple way to make some money quickly is to sell some of your old and unwanted gadgets, games, CDs or DVDs online. Websites like Music Magpie* are easy to use and they now even offer same day payments, so that you’ll get paid the money you’re owed on the day your items arrive with the company. We’ve already mentioned selling your old gadgets and CDs but what about all the other stuff you have lying around the house? Is it time for a good old fashioned clearout? If you really think about it and have a root through your old clothes – and perhaps even venture up into the loft if you can stand the spiders – then I’m sure you’ll find plenty of stuff around the house that you can sell on a site like eBay*. This is one of the best and quickest ways there is to raise some extra money. If you’re looking to raise a few hundred or even a few thousand pounds, then selling an old or current vehicle might help you to raise that kind of money if you really need it. While it might sound like an extreme option, after examining their circumstances many people have decided that they could actually live without a car. Or, perhaps you could downgrade to an older model for a while while you get your feet back on the ground financially. If you need the money quickly then a company like webuyanycar* can give you a price for your car today and have the cash in your bank in as little as 30 minutes after your appointment with them. Do you have any particular skills that you could sell online to earn some quick extra money? Perhaps you have some IT knowledge that could be useful to online workers around the globe, or some design or writing skills that could be useful to website owners? If you have the skills or even the determination to learn, then there’s a lot of money to be made online these days. To get started, check out sites like Fiverr*, PeoplePerHour and Upwork. We hope some of the tips and websites mentioned in this post will help you to raise the extra cash you need quickly and without too much fuss! 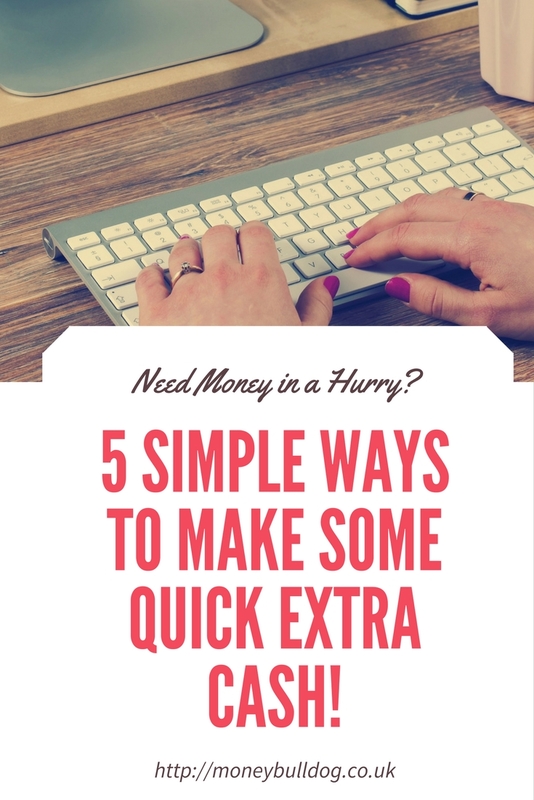 One Response to 5 Simple Ways to Make Some Quick Extra Cash! All the services we have these days make getting rid of your vehicle a little easier if you live close to a major city. Car share services, delivery services like amazon and food delivery from some grocery stores. More people would be able to do without a vehicle than they realize. It can be such a huge expense to no longer have.